Dads deserve our thanks. If I could, I’d pick up my phone and call Dad right now. 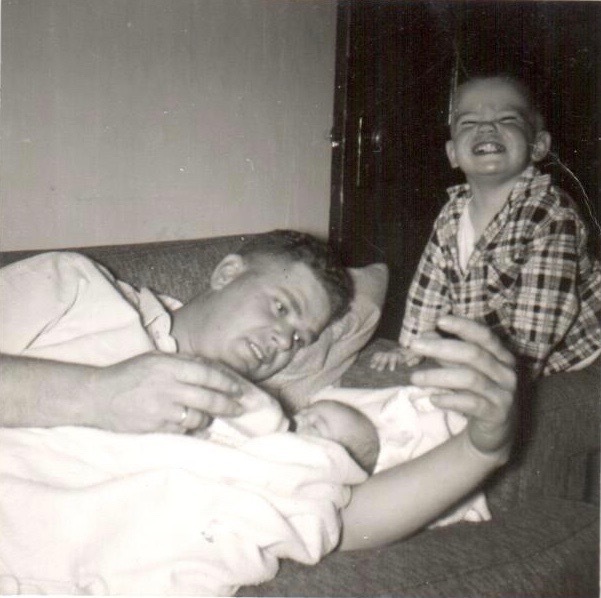 “Hey, Dad, do you remember feeding us as babies on the living room sofa? Which of us three kids kept you on your toes the most? Do you remember the time you . . .?” On and on I’d pepper my father with questions and hear his soft chuckle on the other end of the line. If I could. I miss those candid conversations with my pa. I miss our rides in his pickup truck out to the “eighty” to just look at the cattle and check the fences. Sometimes just a cruise out of town to do nothing really but watch the sun set from the top of the prairie hill. You haven’t lived until you’ve watched an orange Nebraska sun stretch endless across the horizon before edging beyond sight at day’s end. Some days, especially around Father’s Day, I long for just one of those memories back to relive with my dad. Even just a few minutes to take in his strength, his kindness, his steadiness. Dad wasn’t perfect, no father is. But Myron Glenn was sure close in my eyes right up to the end when he could no longer out wrestle his cancer. So many of you have joined me in the club we never wanted to join: Fatherless Sons & Daughters. You too bypass the Father’s Day card sections, you no longer purchase gifts to send your dad. You catch yourself wanting to run the big decisions and best-ever news past him, but stop yourself before you instinctively dial his number. If I could. I’d bring Dad back for as long as possible—even just one brief minute. And I’d thank my dad for being him. For helping nudge and coach and guide me from my earliest diaper days. For holding the barbed wire fences so I could crawl through. For sharing his ice cream cones with our family dog. For letting me read the newspaper comics when he wasn’t finished with them yet. For stopping to get Casey’s donuts on those hour-long drives to his oncology appointments. For enjoying my friends almost as much as I do. Dads, even dads who’ve been less than stellar with their presence and care, deserve even a simple “thank you.” A thanks for contributing to our being alive in the first place. Perhaps a thanks for the thoughts, prayers, and counsel—spoken and unspoken—that have helped shape us into the incredible people we are today. If your father is still alive today, thank him extra this Father’s Day. If your father is still alive today but you are not in touch with him, thank him extra this Father’s Day. If your father has already passed like mine, thank him extra this Father’s Day. He may be out checking fences or watching the sun set with my dad, but I bet those boys will still get our “thank you, Dad” messages. “I try to live my life like my father lives his. He always takes care of everyone else first. He won’t even start eating until he’s sure everyone else in the family has started eating. Find other inspiring quotes about fathers here. These are beautiful thoughts. God is a father to the fatherless. That can be comforting if one did not have a present or loving father. God as a “father to the fatherless” (Psalm 68:5) is such a wonderful reminder of God’s loving nurture. He is always present. Thank you for sharing your encouragement, Summer. Very sweet, Beth. A loving tribute to a wonderful dad! Thank you, Nancy. He was a wonderful dad in countless ways. I know you have your own dear memories of your dad. We miss them so. Beth I love this. Im posting a link to it on my own blog. Your thoughts are perfect on Fathers! What amazing memories and so much for all of us to think about with our Father’s. Thanks for the gentle reminders. Lots of love! Thank you, Terry. None of our dads are perfect, but I do think many need more encouragement and gratitude from the rest of us. Moms too!